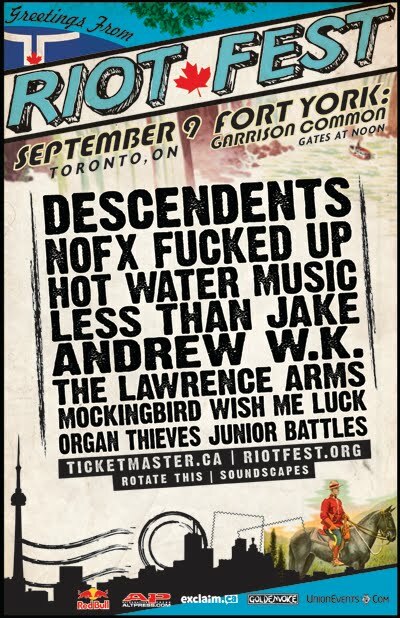 On September 9th, Toronto plays host to Riot Fest, the Chicago-born music festival known for bringing together influential rock, punk and underground music artists from across musical eras, all under one roof. 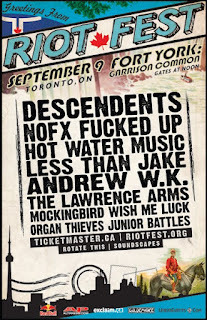 This is the first year the popular music festival, which formed in 2005, has come to Toronto and also marks the first-ever Riot Fest show in Canada. Confirmed headliners for the Toronto tour date include legendary California punk rockers the Descendants, LA skate punkers NOFX, and the "party hard" Andrew W.K. The event will take place in the Fort York: Garrison Common, which is both unusual and interesting given that the City of Toronto operates the location as a historic site museum. NOFX: 8:20 - 9:20 p.m.
Fucked Up: 7:15 - 8:00 p.m. Hot Water Music: 6:10 - 6:55 p.m.
Less Than Jake: 5:00 - 5:45 p.m. The Lawrence Arms: 4:05 - 4:40 p.m.
Andrew W.K. : 3:15 - 3:50 p.m.
Mockingbird Wish Me Luck: 2:30 - 3:00 p.m. Junior Battles: 1:45 - 2:15 p.m. Organ Thieves: 1:00 - 1:30 p.m.
For a full list of what's allowed and not allowed at the festival, click here. Tickets are still on sale, and can be purchased through Ticketmaster. Riot Fest is moving to Chicago next, from September 14-16, for a big three day music festival and carnival, and then it's off to Dallas on September 22 for the final show.